Today is the last day of AEDM - Art Every Day Month - hosted by the inspiring Leah Piken Kolidas of Creative Every Day. Leah has hosted this energizing challenge every November for several years. Even though it is a busy time of the year and even though I can't seem to manage to post every day, nonetheless, it is month of awareness, creative ideas, artistic community and making art a priority. To Leah, I say, "Many thanks for making such a welcoming space for creative souls!" 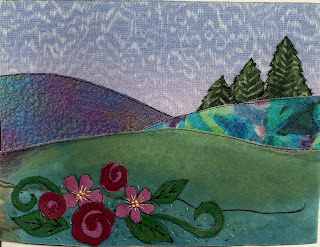 I'm just getting over a stomach flu and not in the mood for sewing or ironing, so I pulled out my scrapbooking papers, did some fussy cutting and came up with this little landscape. I just couldn't miss the last day of the challenge!! To all fellow AEDM participants, I've loved viewing your work, making some new friends and sharing this experience with you! Let's keep the creativity going!! Today is day 27 of Art Every Day Month. I can't say that I've posted something every day, but the challenge has spurred me on to do some things I probably would not have tackled otherwise! So, for that I am thankful!! 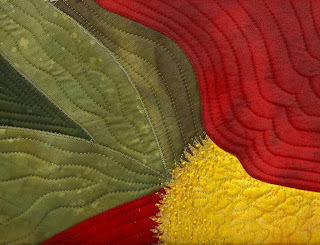 This is a small piece of fused fabric art which I have been hand embroidering for the past few days. and throughout this holiday season!! Arghhh - I'm doing just what I didn't want to do - thinking too hard about creativity and being stuck in limbo! Time to listen to my muse, Coach Irma, and just let things flow, be free and enjoy making art! which will be done in a combination of paper and fabric. I have known the little girl's mother since she herself was a small child, so this is a delight to do. This is my second sketch, just trying to get the right expression. I think it will be very sweet! I'll share how it develops as the days go on! 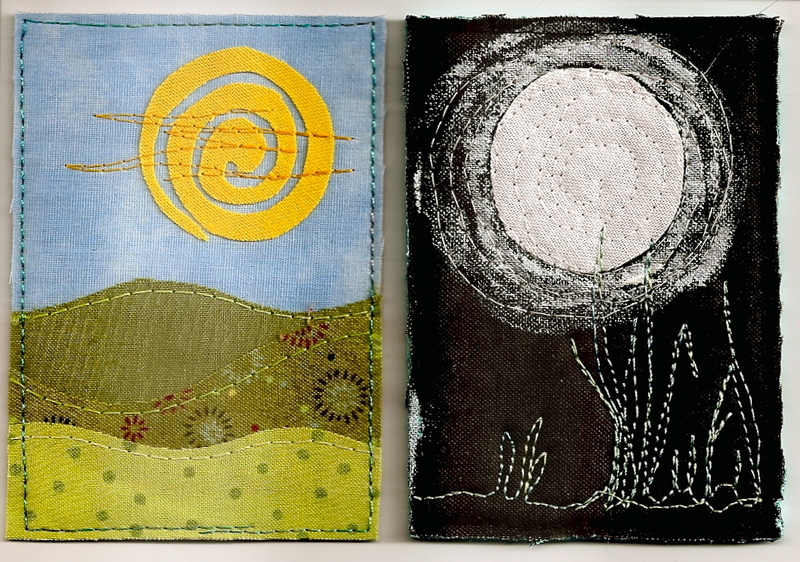 I've received some terrific ATCs from friends lately (lucky me! ), and I thought I'd share them with you! Then Karen's mom, Elaine, gave me several ATCs, and they came in a pink cardstock box which she made herself! 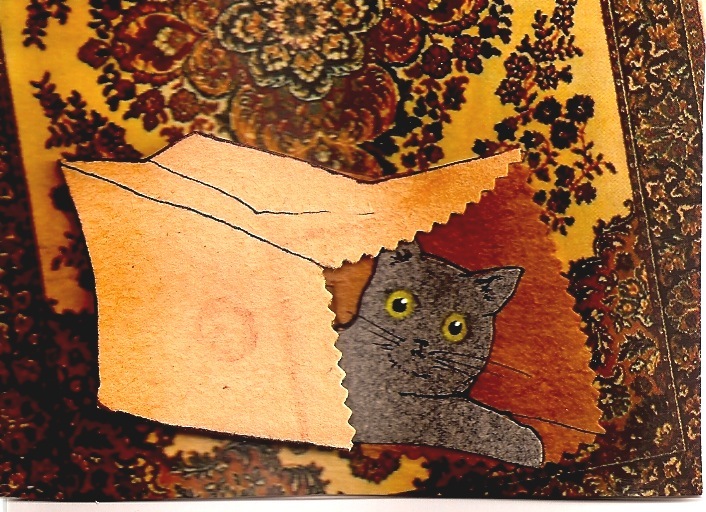 But my favorite card from Elaine was this wonderful image which looks a lot like my cat Angus! 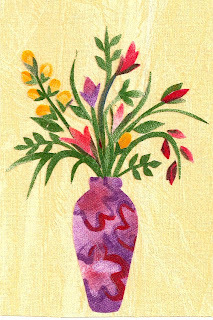 Elaine uses colored papers and clippings from magazines and catalogs for her cards. So clever! And my friend Janice sent me these lovelies, made with watercolor markers, stamps and mixed media! All of these will go in my ATC album, which I enjoy so much and look through often. Thank you so much, my dear friends!! 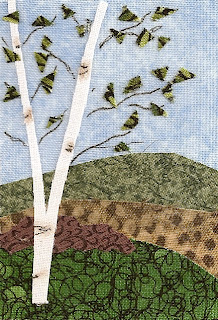 Here is another little fused fabric piece. I was away at a lovely gathering of friends the past couple of days and we exchanged ATCs and shared recent projects we have been working on. This and yesterday's piece were the ATCs I gave out. Tomorrow I will show some that I received from Karen and Elaine. It was a lot of fun - sharing, chatting, laughing, eating good food and generally enjoying each others' company. Can't wait for our next get-together in the Spring!! I've been away from my blog, but I'm back in the saddle again! This is a little fused fabric piece with touches of acrylic paint. Hope all who read this are having a great week! Happy Veterans Day to all the wonderful men and women who have served and who are now serving our country! it is not that easy to exercise at home when you have TWO personal trainers!! Yesterday I sat with friends, all of us chatting and stitching on a rainy afternoon. So nice! I was working on this embroidered cloth which I had started back in February. You can read about my inspiration and the beginning of this project here. I like hand stitching and my goal is to cover this whole piece with all sorts of stitches, almost like a sampler. my snoopivisor Rosey just had to get in on the act!! Hope everyone who reads this has a great day! I'm getting into a pattern of working on something one day, then posting about it the next. So this is what I worked on yesterday, Sunday. It was a quiet day, as my poor hubby has the flu, so I spent much of the afternoon in my studio while he rested. 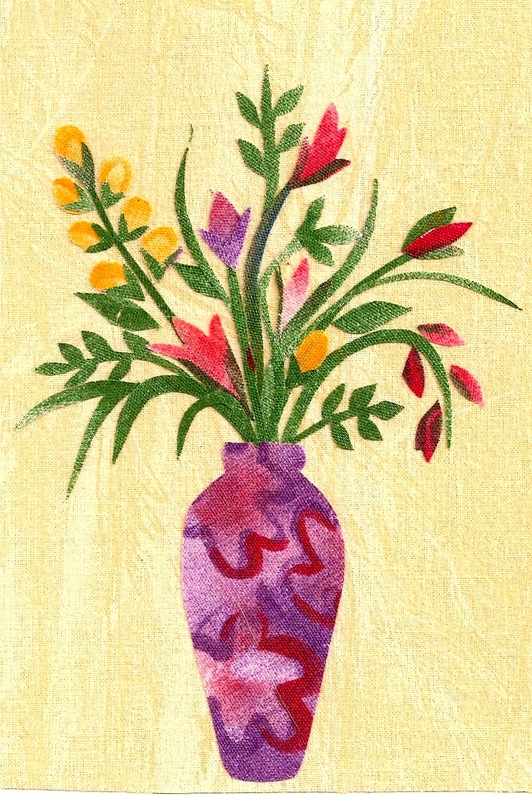 I had previously painted this piece of linen with Pebeo Setacolor textile paints. I like the way the grayish color of the linen subdued the colors I used and the result was very soft. I found a piece of lavender cross stitch fabric in my stash, liked the texture with the linen, and fused the painted piece on to it. Oh and I had trimmed the linen and frayed the edges. 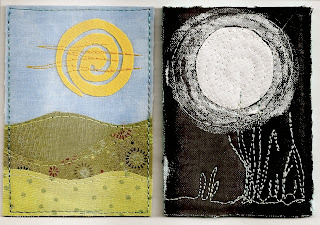 Next, I did some loose machine stitching to suggest details in the earth and sky. Finally, I added more machine stitching, some hand embroidery and then trimmed the whole piece. Although I thought about leaving the ends of the threads floating free, neatness prevailed and I pulled all pieces through to the back! and a closer view of the stitching. By the time I finished, with the time change this weekend, I looked up and saw the sun setting outside my window. It felt good to complete something! Hope everyone has a lovely week!! This work-in-progress has been hiding in my "in progress" drawer for quite awhile. 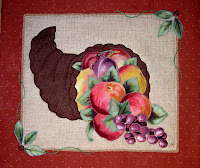 It was part of a challenge I was part of and represents a tiny corner of a Georgia O'Keeffe painting. I'm going to finish the beading and add either a mat and frame, or a border. Also painted more fabric today and enjoyed that - a continuation of what I was doing yesterday. The next step will be to use the hand painted fabrics in a landscape or still life. Art Every Day Month is helping to make me conscious of art, every day and I'm happy about that. Today I decided to work on some fabric painting and I spread out in my 'laboratory' (on top of my washing machine!). I've been painting some black and white print fabric with moss colored Setacolor fabric paint. Since it's transparent, the design comes through and I've been experimenting with different brush strokes. Once the fabric is dry, the paint can be heat set and becomes permanent, so there's a choice to blend paints right on the fabric by spritzing with water, or heat setting the first layer and then overpainting with a second color. Since I know I'll be cutting up the fabric for applique, I usually try a few techniques on the same piece of fabric. I also worked a bit on this piece of cotton fabric which I had previously designed with a paint masking gel (I can't find the tube to tell you the brand) and a fine Sharpie (waterproof) pen. The gel parts I'll paint over with acrylic paint, let it dry for 2 days, then wash the fabric to remove the gel. The Sharpie designs I'm painting in with my fabric paints, which I will then heat set. This is all absolutely playful experimenting for me, and I love it!! Today I'm showing a card I made years ago, but never posted on my blog. 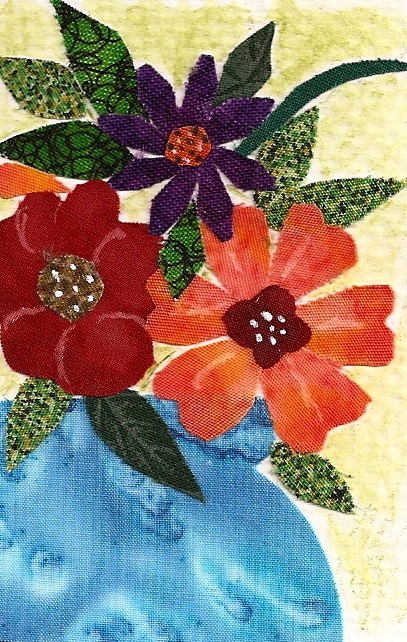 It is a fused fabric bouquet - very small - only about 4"x6". It was part of a series of florals, with very tiny fabric leaves and petals cut out using scherenschnitte scissors Most have been sold or given away and there are only a few left. Hope to have something new to show tomorrow! Rainy weather here - good days to hunker down indoors and do something creative! 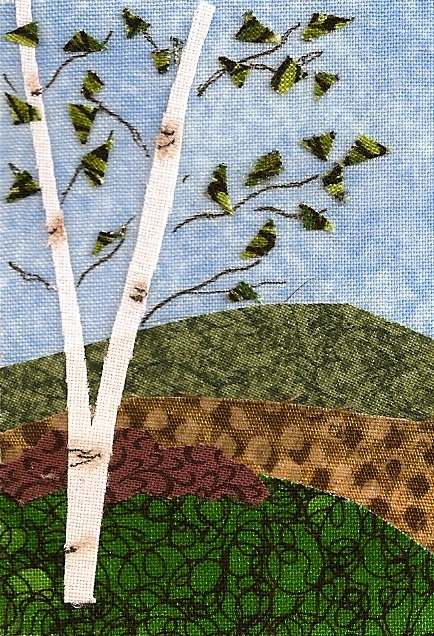 My effort for today is a whimsical fabric landscape, fused and machine stitched, with a bit of hand embroidery and beading. I had already begun this piece quite a while ago, and I'm happy to have finished the main portion of it. Now to add a border - I'll get to that later! I'm so happy to be visiting the blogs of all the Art Every Day Month participants - it's great fun! You can find the list here. Today begins AEDM, or Art Every Day Month! I participated in this challenge last year, met many other creative folks through their blogs, and really enjoyed the whole process. Leah Piken Kolidas, who organizes this challenge, makes it very clear that there is really no pressure to produce something every single day, and I have to remind myself of that. But I feel that I need a creative push right now, and I'm in it to have fun and be creative. I've set some goals for myself this year: use more color, loosen up, and celebrate pattern and print! 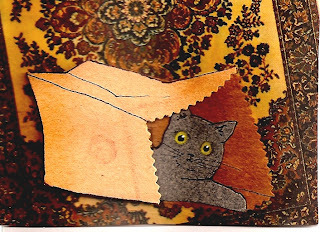 Because of time constraints, I'll be doing mostly fused fabric or cut paper pictures or collages. This fused fabric applique comes from a memory of my childhood. I was about 12 years old, wearing my new cordovan penny loafers and purple knee socks, and walking along a sidewalk in the fall. I can see it in my mind as clear as a bell and it is an image I've carried with me for many years! I may add some stitching, and this piece will go in a new fabric art journal of memories I'm starting for myself. A lot of my memories reside in my imagination like snapshots, so it should be interesting!